Steam juicer Review: I love it! The first time I saw one of these in action was in Holland when I was visiting at a friend’s place. This was not something I grew up with, I was raised straining fruits though linen or cheese cloth or using the old-fashioned cone with the wooden pusher, round and round for pushing out the juice and pulp but leaving behind the skins and seeds. I started looking for one locally for a few years and finally got one on a 55% off sale on amazon, it’s also available at Lee Valley Tools.. but it never went on sale and its spendy! at 250 approx when full price.. watch amazon around Christmas time and it will be found on sale for a much better price and free shipping. But don’t just use it for juice, use it to blanch for freezing, the bottom pot is ideal of making jelly and jams in it! 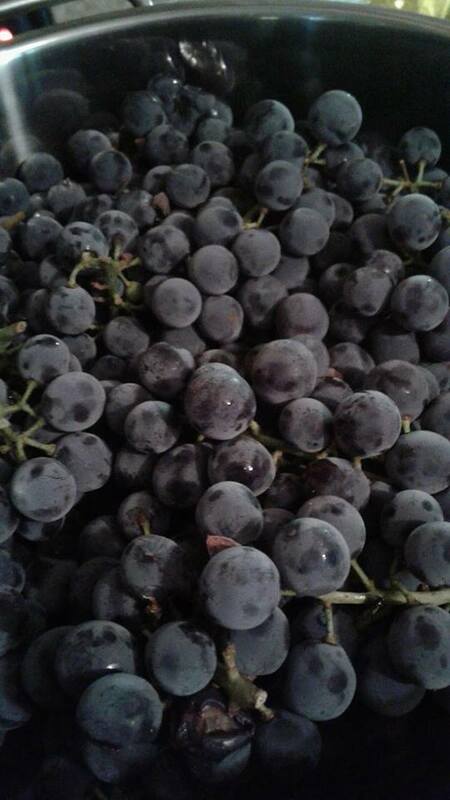 The juice/jelly grapes are ready! Filled to the brim with fresh concord grapes. Its just that simple, clean the grapes so there are no bad ones, no leaves etc. and then put the lid on and let it steam away, soon enough the juice will start coming out of the spout and into your pot or bowl.. If you filled the pot to the correct water level and filled the top to the working top line, you can just let it go.. if you add more fruit as it goes down, then you will need to keep a eye on the water pan and keep it topped up with boiling water from a tea kettle. You will be very surprised the first time you use this, just how little is left after the steam does its job 🙂 The pureness of the juice is hard to explain but it just takes everything up a level..
Two big covered pots worth of hot grape juice are now cooling for a bit on the deck until its cool enough to go into the fridge to chill down.. It would have been very possible to can the juice right afterwards. Look at the color.. so pretty! However I have other plans for the afternoon and I want to chill the juice so that the sediment will settle to the bottom and I will take off the top juice for a batch of grape jelly. Do you use a steam juicer? I highly recommend getting one when you can find one second hand or on sale to add to your homestead home processing equipment. 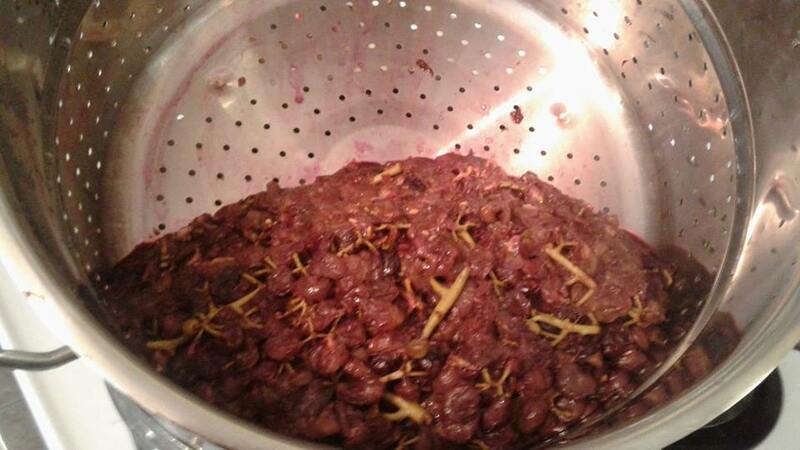 This entry was posted in Canning and tagged Grape Juice, grapes, Making Grape Juice, steam juicer, Using a Steam Juicer. Bookmark the permalink. You’re right – they’re a little spendy – but he didn’t care. I use it a LOT. 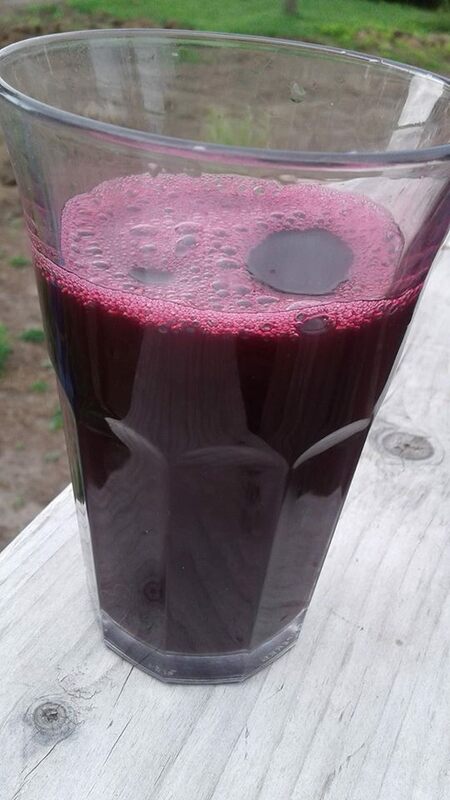 All the pull left after juicing goes to my chickens. I have one as well, and this is my second year using it with our Concord grapes. Last year I made mostly jam, but the couple quarts of grape juice were so delicious that it’s all I’m making this year. Glad you are enjoying your BlueStemPond as much as I do mine.. That grape juice is just amazing. I can totally understand why you are doing so!